A SINN FÉIN MEP has called for a ban on super trawlers fishing in Irish waters, bringing again into focus the contentious issue around the controversial vessels. Liadh Ní Riada last week called for an “effective ban” on super trawlers fishing on Irish waters through the government implementing “relentless monitoring of their fishing activities”. Super trawlers are massive fishing vessels that catch large amounts of fish. Under the EU Common Fisheries Policy, any vessels registered in the EU are allowed to fish in any EU waters. The vessels regularly cause controversy when they appear on Irish waters, with local fishermen expressing grievances over their size and a perceived lack of regulation and inspection surrounding them. “Super trawlers are seldom if ever boarded and seem to be immune from any form of inspection,” said Ní Riada. Which stands in stark contrast to the treatment of Irish fishermen, who are subject to very regular oversight and who are routinely punished for even the slightest discrepancy in record keeping. 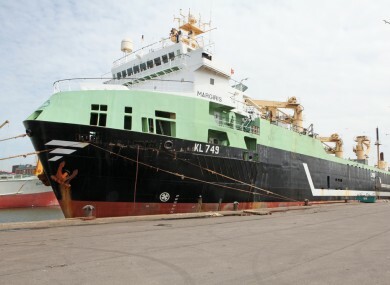 Last year, the second largest trawler in the world – which had been previously banned from Australian waters – returned to Irish waters and concerned people in the industry. At the time, Francis O’Donnell from the Irish Fish Producers’ Organisation told TheJournal.ie that there are issues surrounding the quotas assigned to these vessels. “The enforcement agencies know that they have quota to be there, or at least they think they do, but they actually don’t know what the quota available to these ships is,” he said. From an enforcement perspective, it’s a real problem. It’s totally unacceptable. Ní Riada said that she had met marine minister Michael Creed in relation to the issue and had raised her concerns. “If the Minister wants to protect fish stocks and give Irish fishermen a break, perhaps a good place to start would be to direct the Sea-Fisheries Protection Authority (SFPA) to lay off Irish boats,” she said. Ní Riada said that instead the SFPA should “instead engage in very close monitoring and inspection of the super trawlers that have been destroying our fish stocks with impunity for years”. In a statement to the TheJournal.ie, a spokesperson for the Department of the Marine said that the minister was “precluded” from getting involved in operational matters to do with the monitoring of fishing vessels. “The monitoring and control of fishing vessels within Ireland’s Exclusive Fisheries Zone are matters for the Irish control authorities,” the statement said. The Minister is precluded from getting involved in operational matters including in relation to law enforcement. The department also said that inspection procedures on boats were “standardised and harmonised” across all stages of the market chain and were “focused where it is most effective through an approach based on systematic risk analysis”. The Control Regulations were introduced so that there is a common EU level playing field and to provide for an effective range of controls across EU waters. Email “MEP calls for "effective" ban on super trawlers in Irish waters”. Feedback on “MEP calls for "effective" ban on super trawlers in Irish waters”.